Play in fantasy, steampunk, medieval, sci-fi, or modern eras. Practice the ways of the sci-magi with realm magic. Hunt down demons from the outer realms. Encounter aliens & demigods as you explore the universe. Customize unique characters, weapons, vehicles, & armour. 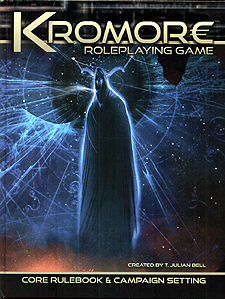 Explore a massive setting over Kromore's 10,000 year timeline. A table top RPG game filled with wonder and excitement at every corner. An easy to use game system that gives choice to players. Hundreds of abilities & dozens of character professions. A diverse possibility filled three action combat system. Bring your adventures to life with Kromore.